Bishop Ide Says people will be spiritually nourished after the programme. 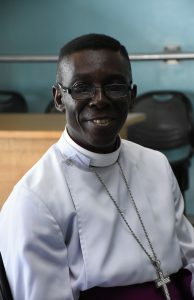 The Bishop of Warri Diocese Anglican Communion, The Rt. Revd Christian Esezi Ide says bad leadership is the major bone affecting Nigeria development. He admonished Nigerians not to go back to their old ways and vote people God will use to salvage the Nation. Bishop Ide made the remark in a chat with news men at the Arrival of the Primate, Bishops and Standing Committee Delegates Meeting holding at Cathedral Church of St. Andrew Okere Road Warri, Delta State with the Theme: “The Lord is my Shepherd”, Psalm 23. He thanked God for the opportunity to host, that this is the first time Warri Diocese is hosting under Bendel Ecclesiastical Province of the Anglican Communion, after 39years. The Warri Diocese Bishop said he believe God that people will leave the meeting spiritually nourished and that their lives will not remain the same. Bishop Ide pointed out that the programme have boosted economic activities of Warri and its environs, noting that the Standing Committee Meeting will usher in God’s Provision, deliverance and protection on Nigerians against social economic trouble bedevlling Nigerians. He urged Nigerians to pray against “Yahoo Boys” Boko haram, armed robbers, kidnappers as well as other related crimes against humanity, adding that the Diocese have embarked on construction of drainage with the Cathedral in order to create more conducive environment for worshippers. AN INTERVIEW WITH THE LORD BISHOP, THE RT. REVEREND CHRISTIAN ESEZI IDE, THE IMMEDIATE HOST BISHOP OF WARRI DIOCESE WITH VENERABLE FOLUSO TAIWO – DIRECTOR OF COMMUNICATION, CHURCH OF NIGERIA. DIRECTOR: My Lord Bishop, as the Host Bishop, what have you to tell us as your assessment of preparations for the meeting and what are your expectations. BISHOP IDE: We give all the glory to God. Warri Diocese is just the immediate host. Otherwise the Province of Bendel has to put resources together to make it all possible. We as a diocese have however spent much more on infrastructure on the venue and for comfort but we are glad because the infrastructure will remain with us. DIRECTOR: Is this the first time you are playing host to the Standing Committee? BISHOP IDE: By next year, Warri Diocese will be 40 years. In fact, we marked our 39th year anniversary in January and this is the first time we are hosting this event. DIRECTOR: At our last meeting in Minna, we witnessed delegates responsible for their own feeding thereby taken off the burden from the host diocese. Has this helped to alleviate the burden? BISHOP IDE: It has given some leverage but some individuals have provided for some food. obviously, we got some relief. DIRECTOR: Could the hosting have drained the purse of the Diocese? BISHOP IDE: Yes of course but the hosting has its blessings too. DIRECTOR: What are some of the spiritual benefits or blessings expected from this event? BISHOP IDE: The theme is Psalm 23 “The Lord is my Shepherd“. From this we have drawn three (3) Sub-themes – Provision, Deliverance and Protection. DIRECTOR: The 2019 general election is just around the corner. This meeting is going to dove tail into the election. What impact is this likely to have on the political climate? BISHOP IDE: Many are crying because of bad leadership yet we still appear to be gone the wrong way. We hope that at the end of the day God would guide us to influence our decisions. It is clear that all is not well and that the leadership must change from the hand of the ruling cabals at all levels. I hope that we still leave here spiritually nourished and whatever situation we find ourselves, we should be able to say “The Lord is my Shepherd“. Going down memory lane, Acts of Apostles, 15, records the first ever council meeting of the living Church of God. This meeting was to resolved an issue that has to do with Circumcision. Some men reportedly came down from Judea to Antioch teaching that unless one is circumcised, one cannot be saved. This thorny issue brought the elders of the Church together to meet with representatives from the Church of Antioch in Jerusalem. Interestingly, the heated argument that ensued between the Pro circumcision or Pharisee group and the others was resolved by the move of the Holy Spirit. What we have to learn from this is that issues are bound to arise in all human affairs even in the Church of God. These issues may not only be spiritual but could be socio-political However, where the Spirit is in control, decisions would be reached to resolve matters amicably so. Since this first Council meeting in Jerusalem, the Church has evolved such meetings at different levels to discuss progress, development and challenges in the Church. Hence Parishes have their Parish Church Council Meeting (PCC); Archdeaconries have the Archdeaconry Board Meeting; each Diocese has the Diocesan Board Meeting – that represents the Synod that holds annually. Diocesan Board stands to discuss and take decisions on emergency issues within the year before and after the annual Synod. Similarly, the Standing Committee of Anglican Communion of Nigeria stands in the place of the general Synod that holds once in 3 years. It must be stated here that the life of any community, state, or nation revolves around the spiritual life of the people. The church is the cradle of peace and progress. Any society or people including government that anchors their affairs on God is bound to succeed. Previous articleARRIVAL OF THE NO. 1 ANGLICAN.